Sweetfern Update: We’re Selling Sunshine! 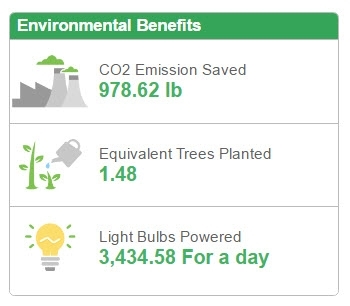 Sweetefern has gone solar! And, as part of Ontario’s microFIT program, we’re making hay money while the sun shines. That’s 10kW of power .. at least when the sun is shining. The path to get here was not easy or straightforward, even with experienced people on the job. We had multiple issues with our application to microFIT. Many things are not clear, and rather than just have you correct mistakes, they reject your application and you have to reapply. We did that 3 or 4 times. Then we had a long delay on our building permit thanks to she of the unnecessary dryer vent and some unfinished business with the engineering drawings. You plan your rooftop solar installation (up to 10 kW) and then apply to the program. Our solar installer did this for us. Once accepted you sign a contract with your utility where they agree to purchase the electricity from you at the current year’s fixed rate for 20 years. Once online, all of the electricity you generate goes back to the grid and you get paid for it monthly. 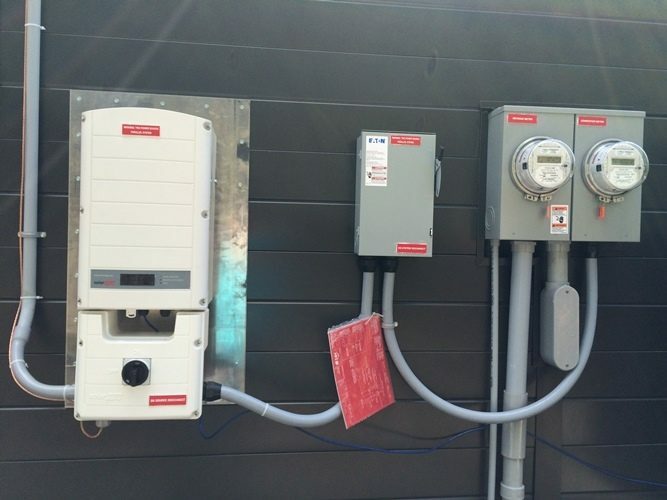 Inverter: Converts direct current from the panels into alternating current to feed into the grid. System Disconnect: Turns it all off and stops the solar power from entering the grid. Revenue Meter: Measures the electricity we use in our home. We still pay for this. Generation Meter: Measures the electricity we generate. We get paid for this. 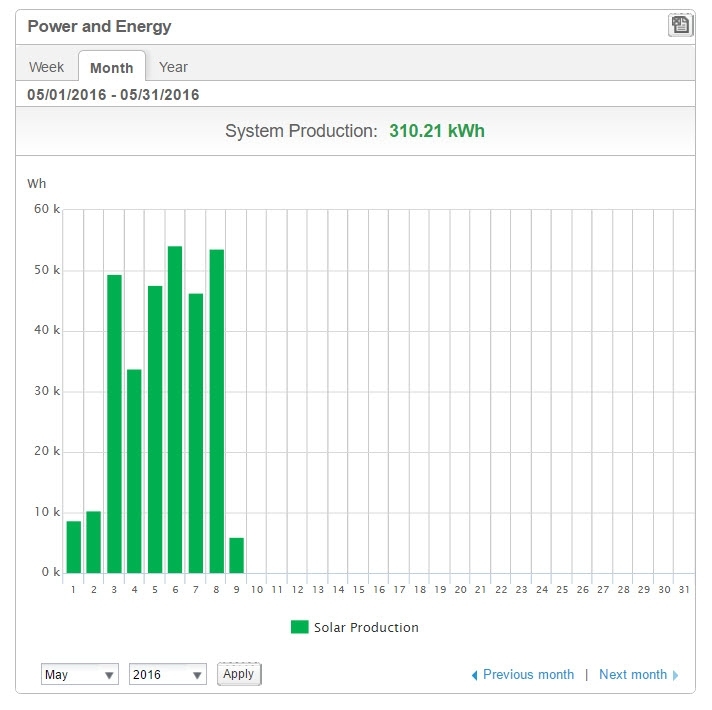 We squeaked our application in in time to get the 2015 rate of of 38.4 cents / kWh. With taxes and delivery fees, we pay around 23 cents /kWh. Our installation, start to finish, cost around $34K. 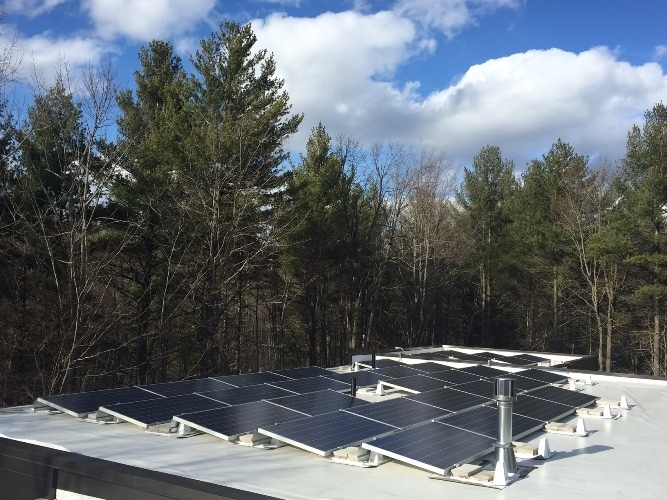 Based on our latitude, average weather, known sources of shadows, and the efficiency of the panels, the installation is estimated to pay for itself in about 6 1/2 years and pay out a total of about $100K over the 20-year contract period. So after we pay off the panels, it’s basically cash on the roof. Of course in practice, our mileage may vary — and in one case, already has. See that beautiful array in the top image? That was designed for optimum sun exposure and formed the basis for those numbers I just gave you. But that’s not how the panels are arranged today. We had to make a change. It turns out that on our flat roof, the panels require a 1 metre setback from the roof parapet. The issue is turbulence. Too close to the edge, and wind swirling against the parapet could lift the panels which are not fastened down because we can’t compromise the roof membrane. They are weighted down using special footings. Do you see the problem here? Hint: South is on the right. 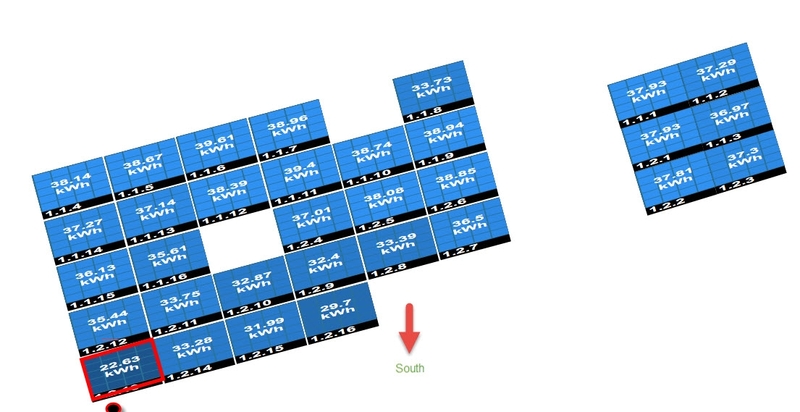 Not only is that panel giving us low output, but the entire front (south) row is now low compared to the back. Those four panels used to be along the west edge. Since they were moved, they now have a bit of tree-shadow on them early in the day. We’re not sure how to solve this, but one answer might be to reduce the height of the chimney to improve the performance of that one panel. Trimming the trees isn’t really an option as they are huge white pines but there might be some smaller ones we can thin. Or, we do have a porch roof (not shown) to the west. So it might be an option to move a few panels over there. However, we’re not going to make any changes until we get more data. We can log into our account at SolarEdge to monitor our system. 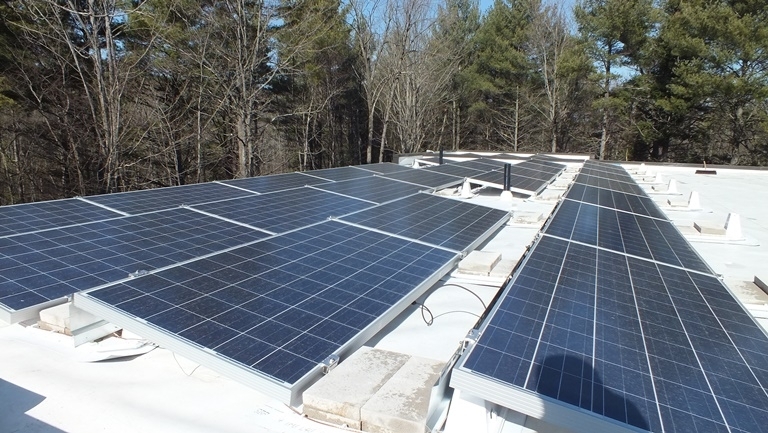 We purchased the panels from SolarEdge to meet the Ontario Content requirement for the microFIT program. And we’re using and estimated 40-50 kWh per day .. So in terms of dollars, we’re coming out ahead. In terms of energy, we’re very close to net-zero. But if you look at the graph above, the low output for the 26th and 27th is due to a light snowfall. So imagine what winter is going to be like. And in this graph below, we have no idea what happened on the 1st and 2nd. Weather was only partly cloudy, compared to the 4th when it rained all day. So we need to figure that out and do better if we’re going to make up for winter months when we’re truly generating nothing. Meanwhile, it feels good to be part of the green revolution. But I must admit that I’m not a fan of solar microFIT. Regular Big Generation must be sized to power everyone at night or non-sunny days without fail. Also, is your system designed to provide you power when The Grid is down for whatever reason? I love the idea of local power generation, but don’t think it is too useful until the problem of storage is solved. Current battery tech isn’t all that good. Would love to be proved wrong. I totally agree about storage (Errrgg!!) However, I’m more of a mind that you do what you can do when you can do it however you can manage it. Some folks climbed on the alternative energy bus early. Then, there are those of us who are clambering on now – even though the seas are still a bit choppy, storage is an issue and toxicity of materials is still a challenge. Still and all, we’ll be some of those diminutive participants who, 10KwH at a time, start pushing alternative energy toward the tipping point! Way to go Kimberly! I also agree about the storage. But individual contribution to the grid makes a difference in meeting peak load demands, especially during summer A/C season. And if we can keep peak loads down, that buys generating stations time (infinite?) before they have to upgrade their capacity. In answer to your question Brian, no we are not able to divert the power to our home during an outage. If we HAD storage (Tesla Power Wall? ), we could store energy from the grid during off-peak hours, and use that when necessary. Alternately, we could install separate panels for our personal use, but there are issues there around metering and protecting line-workers during an outage. Not sure how that works. We are in a transitional time. There are lots of bugs to work out and the fastest way to work them out is by having early adopters and people willing to be the guinea pigs. Squeak squeak! Thanks for your comments Brian and Margo.